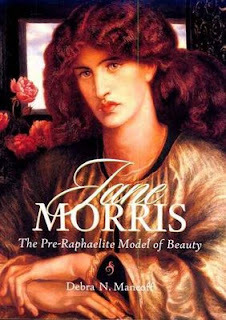 The Broke and the Bookish : Regarding Jana and "Jane Morris: The Pre-Raphaelite Model of Beauty"
Regarding Jana and "Jane Morris: The Pre-Raphaelite Model of Beauty"
Publishing Info: Published by Pomegranate Communications, Inc. in 2000. How I got this book: I checked it out from the library and later bought it on Amazon. Why I read this book: I used it as a reference for a paper I did for my 19th Century art history class during my final semester of college. So here’s the skinny. First, you need to know what the Pre-Raphaelite Brotherhood (I’ll refer to them as the PRB from here on out) was. The PRB believed that an artist, whether painter or writer, ought to be bent upon defining and expressing his own personal thoughts, and that they ought to be based upon a direct study of Nature,. These artists rejected the pre-established ideas of beauty in contemporary (19th Century) Victorian society. They based beauty off of observation and expression instead of an idealized mask. In their quest to depict or copy Nature, they frequently sought out forms that were ugly and unpleasing to the eye. Instead of portraying a beautiful, idealized figure with an oval face and graceful features, they enjoyed portraying figures with oddly shaped heads, blemished and irregular faces, bulky ankles and knuckles, and abnormal skin tones that viewers were not used to seeing in art. In fact, many members of Victorian society saw these Pre-Raphaelite depictions of unidealized beauty as vulgar and unacceptable in the art world. If you look through the pictures of Jane in this book, I’m sure you’d say to yourself something like this: “I thought these artists believed in depicting ugly things. Jane’s beautiful.” Well, today she would be considered beautiful, but in Victorian society beauty meant petite, blonde, fair, and perfect. Jane was none of these. She was tall during a time when small stature was highly valued. The sharp angles of her face challenged conventional beauty. She ignored the latest fashion trends and dressed simply. Her pale complexion stood out against her dark, wavy hair, making her look exotic in contrast to the bland standards of Victorian beauty. She was a simple girl, born into a working-class Oxford family and had low expectations for her life. Other girls of her social standing either married within their class or became maids or servants. Shortly before she turned 18, though, she caught the attention of Dante Gabriel Rossetti, the founder of the PRB movement. He persuaded her to model for him and a few of his other artist friends, beginning the dramatic change of her life. Jane shaped Rossetti’s opinions on beauty and she became his new model of the “ideal”. He said, “Beauty like hers is genius.” She married PRB artist William Morris, but her heart belonged to Rossetti. His paintings of Jane show viewers the love he felt for her and even though she never left her husband, she gave her heart to Rossetti in return. His love for her turned into an obsession. When she grew very sick, he wrote to her and told her he could no longer hide the depth of his love. Eventually they went their separate ways, much to Rossetti’s dismay. His devotion had become desperate and demanding and his depression was weighing her down. They remained friends until his death, but he rarely saw her. Even so, he still found solace in painting her image and she was the subject of most of his paintings. You’ll need to picture this with me in order to understand the level of love I had for this book. It was the last week of my last semester of college. I had just finished an art history paper and, as a result, was late beginning the next one—my last one ever. It was snowy and cold outside, with Christmas just around the corner. It was very late (the night before the paper was due), I had not really started, and everyone had been asleep for hours. Needless to say, I was NOT in the mood to do this. After hours of writing, I grabbed this book from the bottom of my stack of 25 library books in a last ditch effort to find something worth including in my paper. I became so enthralled in the story and the beautiful color images that I quit writing my paper. It's really interesting that there's such a deep love story entwined in an art history book. Sounds like a really fascinating work. I, too, took unrequired art history classes in college - and I think my friends thought it was even weirder because I was a science major so there was zero connection to what I was studying! When I first saw your review and knew what it was about, I honestly wasn't sure if I would like it but after reading your review I actually think this sounds quite fascinating! lol. I thought about writing a disclaimer on this post, recognizing the fact that I knew it would not interest quite a few people. I've never liked an art history books so much, though, and maybe there's a few art history students out there who might need this book one day! lol.